Most of the time when I'm taking cuttings to root plants I just slap them in a jar of water on the window sill. But today I thought I'd make more of an effort since I generally have to look at these things for at least a couple of weeks. I gathered some things I had around the house to see what I could come up with. When cleaning out my mother in law's apartment I found a charming glass and silver coffee percolator. Sadly the glass carafe was broken so I removed it from the silver handle and tossed the glass. This darling footed bowl was what the carafe sat in. It has a hole on one side where the plug came out. I removed it and was left with this really cute piece. I filled the jar with water added the ivy, sat it in the bowl and filled the space in between with Styrofoam. I used a little spray adhesive to stick the moss on and cover the white. I added some dried vines for some added height. 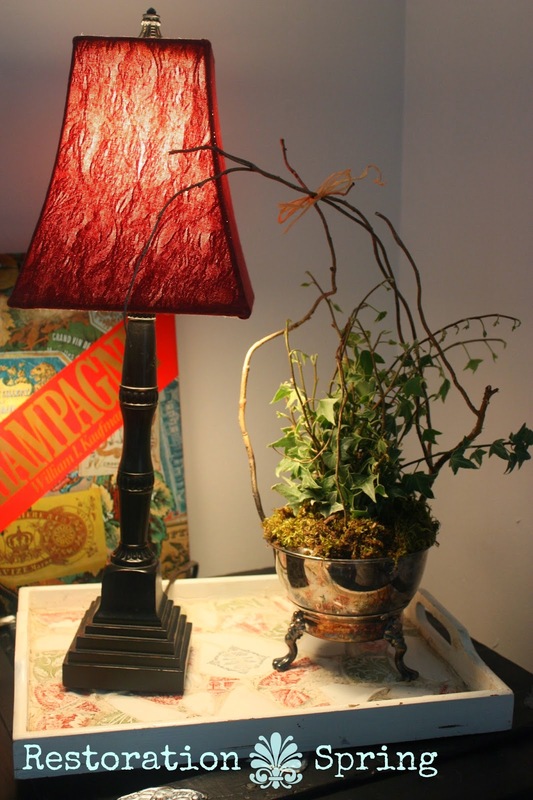 I can pull the ivy out of the jar to check for roots without disrupting anything else about this arrangement. later I can use it for other cuttings or take out the Styrofoam, add soil, and plant the ivy back in it. This project took about 10 minutes and cost me nothing. I'm using this to root the ivy but this would make a super simple centerpiece in a pinch. My favorite projects are quick, simple, and make something from nothing.